We made this cake for Tango, to celebrate the birthdays for the month of December. I always get "creative freedom" when it comes to their cakes but this month that worked in our favor especially considering I might need to make another one of these next week. I thought I could use the practice and make it on a smaller scale - and it actually ended up being a lot of fun! I made 3 eight inch cakes, 3 six inch, 1 five inch and 1 two inch. (assorted chocolate and vanilla) Rodney stacked them all and carved them into the cone shape. The leaves are overlapping diamond cutouts (fondant) and I made the ornaments by melting down jolly ranchers and shaping them into balls. I also added silver dragees for the "twinkle" effect. 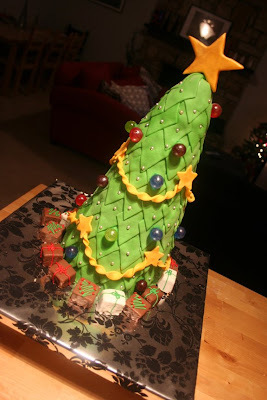 The "gifts" at the bottom of the tree are petit fours that I dipped in either milk or white chocolate. I would love to try your petit fours sometime. Hint, hint. I could imagine what this cake would look like if i attempted to make it. Wow..! That Christmas tree is so yummy. 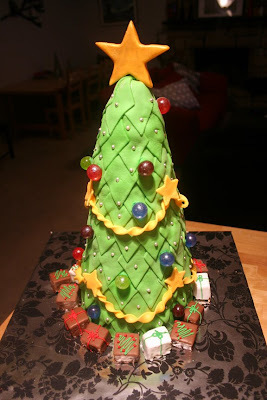 This is my kind of tree; it doesn't leave any messy needles all over the floor and looks delicious :)!